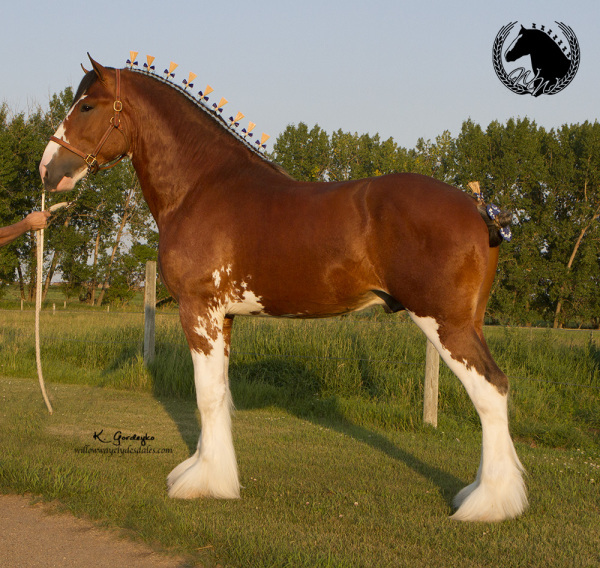 Kelso's debut in the show ring in 2012 was highly successful, claiming championship titles at both Olds & Calgary. In 2013 he was Champion again at Olds & Res. at Calgary. 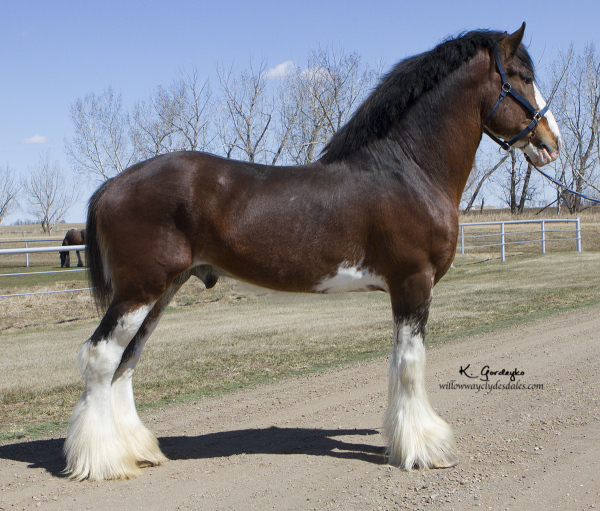 He was named All-Canadian aged Stallion in 2013. In 2014 he held the position of right wheel in our 6, and did a fantastic job working with the 5 mares. He was awarded Res. 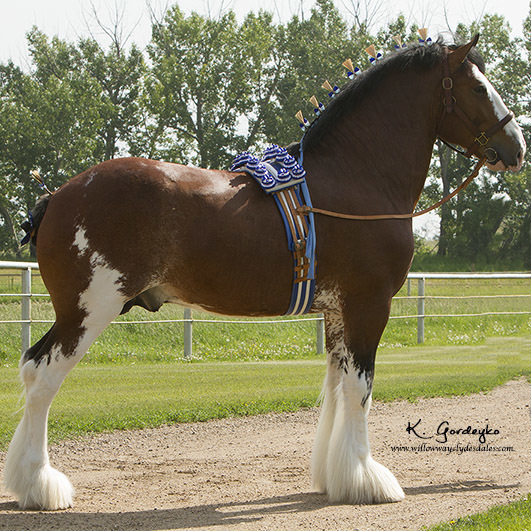 Champion Stallion at Olds & Champion at Calgary. His show career finished up with the title of All-Canadian aged Stallion again in 2014. Kelso's pedigree combines the most proven genetics here on the farm. Bacardi contributes the impressive Omega & Jubilant blood, but it's his dam side that really gets us excited. Mare families are very important to us here at Willow Way, and Kelso has one of the best. His Dam, Willow Way Farrah, is a daughter of Torrs Cup Winner & Willow Way Annette (x Torrs Quicksilver). His granddam, Hatfield Duchess, was a female that was super modern for her time. She passed her length of neck and size on to all of her offspring, today on the farm we have 4 generations of Duchess females. Kelso's first full foal crop arrived in the spring of '15. We are beyond satisfied with what he has been throwing, very correct limbed foals with great head sets & length of neck. We look forward to bringing some of these Kelso's out to the shows in 2017. In the fall of 2015 we were given the opportunity to enter into a partnership on Kelso with Anderson Farms. We were elated that they chose Kelso's genetics to add to their highly successful breeding program. Anderson Farms is the home to the current World Champion Mare, Anderson's Ovation. He is a modern type of stallion but quality isn't compromised. He offers superb bottoms, a wide flat hock, a ton of animation and his beautiful top. Firestone's dam was a big mare with imported bloodlines - Croydon Aristocrat on the bottom & by the stallion Willow Way Commander, a horse with parents both imported by Allan - Torrs Final Command and the prolific mare Torrs Lady Antrim. Fire's dam, Lexi, produced her size & quality time after time. A few of her sons went to the Hallamore Hitch, famous for their tremendous size & perfect colour. Our first crop of Firestones are nothing short of impressive, they are a leggy bunch with brains and style, and an abundance of quality. From the time of conception, we knew that if Omega's dam, Carlene, produced a colt it would be a stallion prospect. Indeed, she gave us her first stud foal and what a horse he's become! Willow Way Omega is a result of selective linebreeding to the horse Live Oak Omega; a horse whose influence we feel launched our breeding program to a completely new level. We are hoping that this horse has the same prepotency as Live Oak Omega, and will have a similar impact on our breeding program. 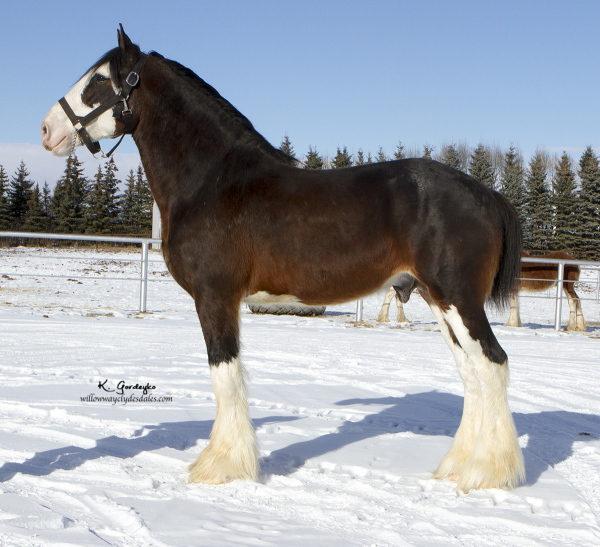 Omega was first shown as a 2 year old in 2017 where he was Champion Stallion at the Calgary Stampede, and was a part of our winning Breeder's Group as well as the winning Get of Sire for Willow Way Kelso. Omega was also named the 2017 All-Canadian 2 Year Old Stallion. He is a sizable horse, currently standing 17.3 hands, with an outstanding front leg, and exceptional width to his hocks, he travels straight with a lot of animation. We will breed Omega to a select number of mares this spring. Bomber is an Irish bred horse who was imported by F.J. Pfannenstiel as a yearling. He is another excellent horse exported by the Bedfords. 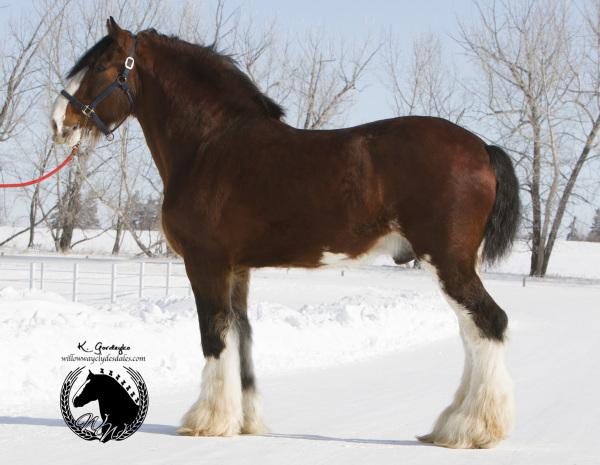 Bomber is a complete outcross to North American bred horses. His sire, Bratlach Millichen is a black horse & his dam, Ainville Queen Bee is a dark bay with a reportedly huge foot. Queen Bee is still producing for the Bedfords into her 20's. Her pedigree is filled with Cawdor Cup winning horses. Bomber is a very high-energy horse who has an exquisit front end, solid top line, a long flat hock, a wide heel and he's an exceptional mover all the way around. 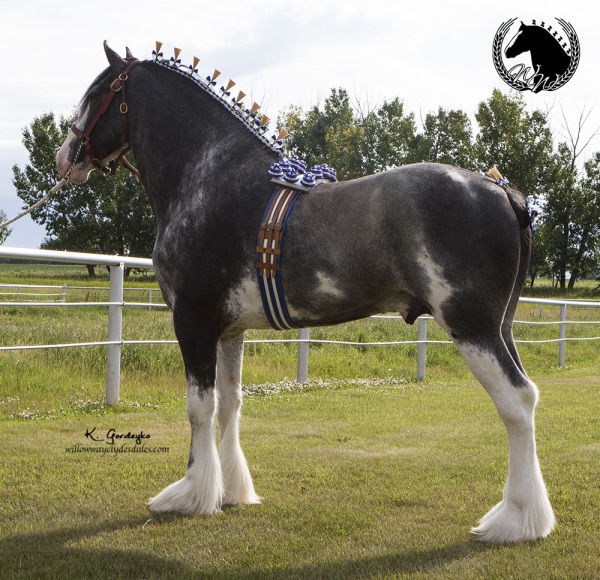 Bomber was shown as a 2 year old at the Calgary Stampede where he finished as Reserve Champion Stallion. We also showed him in 2017 where he won his class and was named the Reserve All-Canadian Aged Stallion. We are once again thankful to Mr. Pfannenstiel for making this horse available to us, we like him more each day! His progeny produced while at Hatfield were of remarkable quality, stature and were all phenomenal movers. We had purchased 3 top quality big-league gelding prospects by Roy, prior to purchasing him, all of whom have been sold to great homes where we anticipate bright futures in harness as well as in halter. We don't have any of Roy's breeding here, so that gives us the opportunity to breed him to a diverse selection of mares. The first Roy foals have arrived who will carry the Willow Way prefix in 2018 and we are very impressed. They are smart, strong individuals that are all perfect colour and have incredible action on both ends. We will have one more crop in 2019. Roy has been sold to our friends Bob & Laura Gookin in Boulevard, California, as they found themselves in need of an aged horse. Roy was sold under the circumstance that when Bob & Laura are no longer in need of his service, that we will have the opportunity to add him back into our program. We are anxious to see the resulting foals from Somewhere Farms, as they have a beautiful selection of broodmares.